HOLLYWOOD (Spiritsman) MANCAN Wines are a relatively new company based in Cleveland at The Ohio City Firehouse which is depicted on each can along the company mascot, Gracey the dog. 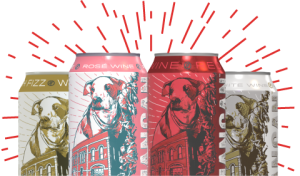 MANCAN is offering wine in a can in four different varieties that are priced at $4.99 for each or $17.99 for a pack of four. To call them brand new to the market would be a misnomer as they already have about 1100 accounts in seventeen states including Whole Foods, and they have been in operation since the Autumn of 2015. The two founders are both in their mid thirties and hosted a media launch at the trendy Pearl Restaurant in Hollywood right next to the Whiskey a Go Go, and yes the live sound of Mike Love of the Beach Boys filtered through the walls as we were sipping the wines. 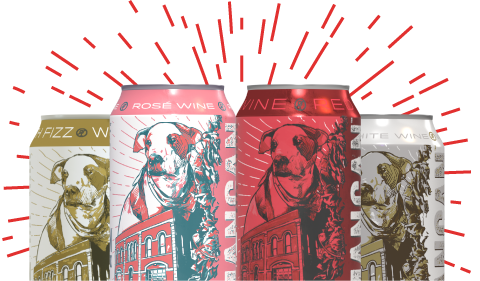 There is special film inside every can which prevents the wine from being affected by the aluminum. The four varieties are Red, White, Rose and Fizzy. All the grapes are Sourced and each can contains 375ml. the equivalent of half a bottle of wine. The Mancan Red is a blend of Merlot and Zinfandel grapes and has a tasting hint of grilled pomegranate. The Mancan White is a combination of Viognier and un-oaked Chardonnay and has the tasting notes of sweet brandied melon. The company has no plans to add to the four varieties even though Wine Enthusiast twice nominated them in the “Best Buy” category. Clearly their market base is the under 35 millennial market and live sporting events are where these wines are particularly fast movers. MANCAN Awesome Wine in a Can LAUNCHES IN HOLLYWOOD, MANCAN WINES LAUNCH IN HOLLYWOOD FOUR VARIETIES OF WINE IN A CAN permalink. TIA MARIA DARK LIQUEUR The perfect conversation starter and accompaniment!